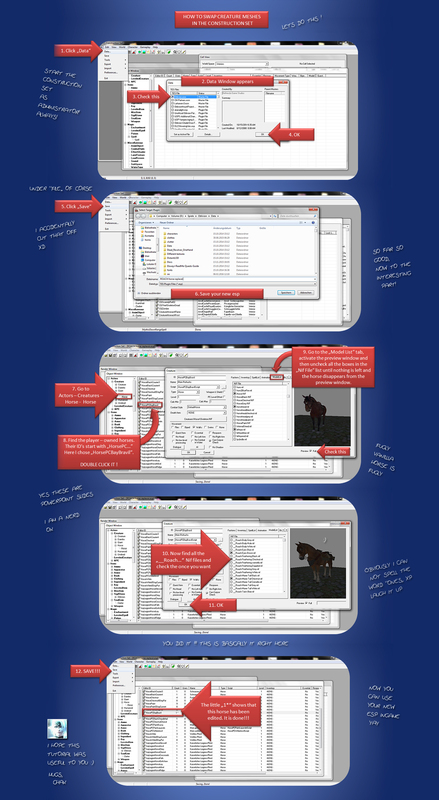 TUTORIALS for modding beginners (ง︡’-‘︠)ง - welcometohawkhavens Webseite! Ahahaha. Yeah. This is kind of a necessity because wigs are not hairs, meaning: they do not have morphs. Some characters have wider faces than others, etc. Also: not all head meshes fit with all wigs. But fear not! Adjusting a wig is not that hard :D Actually it is really easy. - Open the .nif file of the wig you want to edit in Nifskope. - A small window appears, with the value 1.0000 set for the X, Y and Z axis. - Change the value you want to edit, then click ok.
- in Nifskope, go to "File" in the upper left and click "save as" to save the changes you made to the nif. If you want the wig to be WIDER, add a few digits to the base value, but keep it small!! If you want the wig to be SLIMMER, subtract a few digits from the base value, but keep it small!! Should the result not be enough, rather REPEAT several times with the same small value instead of going for the big numbers. 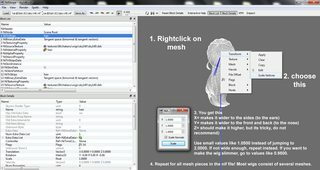 99% of all wig nif files consist of several mesh pieces! You have to edit all wig parts with the same values to make everything fit together! So you need to memorize the values you used and how often you used them. Nifskope has no "undo" button, so experiment as much as you want, but only save the nif if you are satisfied with your result. Click for original size. Huge image ahead!